Now let’s dissect this wording into something that is easy (or easier) to understand. If you find more than 15 insects on the jacket leaves, score the head as a defect, scored as serious damage, against the tolerance of 5%. 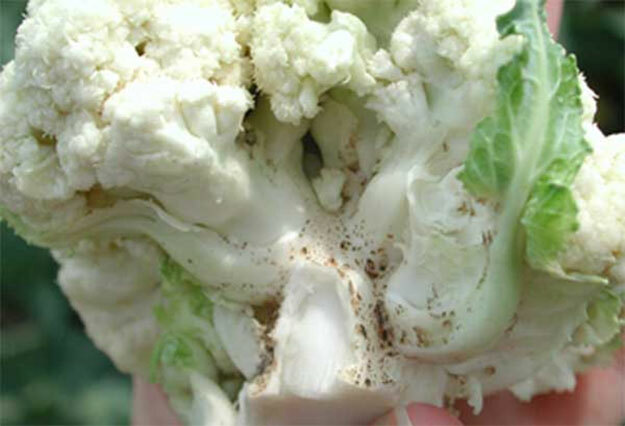 It looks like the USDA has covered all the basis, but what may seem a bit surprising is the fact that the USDA does not see a problem with a head of cauliflower being infested with 1-5 insects on the curds, meeting the requirement of the U.S. No.1 Grade. Also, there is no mention of worm injury or worms if found on the head of cauliflower. We will have to assume if insect feeding injury is a defect, so too would be worm injury. I would also think finding a worm on the curd itself would be objectionable, thus meeting the definition of “materially affecting the appearance,” so score the head as a defect. Let me know if you agree with my reasoning, worms and worm injury affecting the curds would both be scored as serious damage defects, against the tolerance of 5%, and worms and worm injury affecting the jacket leaves would both be scored as damage, against the tolerance of 10%.